Product prices and availability are accurate as of 2019-04-09 12:05:58 EDT and are subject to change. Any price and availability information displayed on http://www.amazon.com/ at the time of purchase will apply to the purchase of this product. 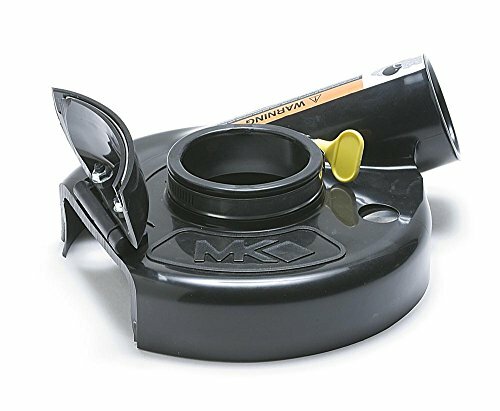 MK Diamond 166964 MK-IXL 7 Inch Hinged Vacuum Shroud has been engineered to control dust during concrete grinding operations. The shroud's snail shape design utilizes the air velocity created by the rotating grinding wheel to efficiently channel dust particles away from the work surface and into the vacuum port. Designed to fit most popular 7-inch and 9-inch grinders, the IXL can be used with cup wheels up to 7-inch in diameter. When used with a vacuum, the shroud helps to reduce cleanup time, provide better visibility and increase productivity. This shroud is specifically designed for cleaning, leveling spots, removing epoxies, urethanes, paint and other coatings, smoothing out uneven surfaces on floors and cleaning glues and mastics after removal of floor coverings.